Esri Press e-books are available through the Esri Books app or from online retailers. Visit Esri Press for more information on all Esri Press publications. 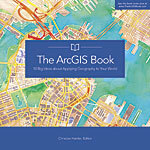 Intended for the professional mapping community and GIS novices alike, The ArcGIS Book: 10 Big Ideas about Applying Geography to Your World helps readers understand and use web GIS, which is transforming the way geographic information is applied and shared. The book explores 10 “big ideas” that show how the Internet has helped digital mapmaking become mainstream. Rooted in the ArcGIS platform, this hands-on book empowers readers to do new things and accomplish familiar tasks more quickly by working with The ArcGIS Book as much as they read it. Using “Learn ArcGIS” lessons, readers make a story map, conduct geographic analysis, edit geographic data, work in a 3D web scene, build a 3D model of Venice, and more. July 2015, 152 pp. Paperback ISBN: 9781589483453 and e-book ISBN: 9781589484313. Every year, works from mapmakers around the world are selected for the Esri Map Book to demonstrate how GIS helps governments, businesses, and citizens. 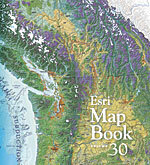 Esri Map Book, Volume 30, preserves this tradition by showcasing maps and applications that use ArcGIS to make sense of extensive and often diverse sets of data in efforts to evaluate resource sustainability, determine efficient transportation routes, mitigate the effects of natural disasters, come up with more streamlined business practices, and much more. This year’s Esri Map Book—which contains descriptions of each map or application’s purpose and how it was produced—is an invaluable compilation for GIS users, cartographers, collectors, and map libraries. July 2015, 160 pp. Paperback ISBN: 9781589484252. 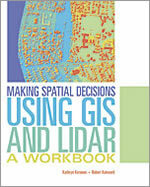 Making Spatial Decisions Using GIS and Lidar, the third workbook in Esri’s Making Spatial Decisions series, focuses on scenario-based problem solving using an integrated workflow in ArcGIS 10.2 for Desktop and above. Authors Kathryn Keranen and Robert Kolvoord employ lidar—a powerful and increasingly popular data source used to create highly accurate elevation and terrain models—as the primary data source, enabling students and self-learners to develop their GIS and lidar-related analysis skills. Downloadable data and access to a 180-day free trial of ArcGIS are available on the Esri Press book resources page. To obtain instructor resources, email esripress@esri.com. October 2015, 264 pp. Paperback ISBN: 9781589484290. Land-use planning has evolved recently—not least because of the 2008 recession. In Advanced Land-Use Analysis for Regional Geodesign: Using LUCISplus, Paul Zwick, Iris Patten, and Abdulnaser Arafat expand on the Land-Use Conflict Identification Strategy (LUCIS) model put forth by Zwick and Margaret Carr in their 2007 book, Smart Land-Use Analysis: The LUCIS Model. For Using LUCISplus, the authors upgrade the LUCIS model—which uses GIS to formulate land-use conflict identification strategies—to address common issues, including the interplay between transportation and land use, the identification of urban mixed-use opportunities, and the land-use implications of natural disasters. 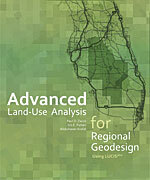 The book also addresses scalable geodesign in regional, urban, and environmental contexts. October 2015, 530 pp. Paperback ISBN: 9781589483897 and e-book ISBN: 9781589484337. 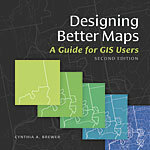 Expanded and with updated illustrations, Designing Better Maps: A Guide for GIS Users, Second Edition, is a comprehensive reference guide that breaks down the myriad decisions mapmakers must make about color, font, and symbology to create maps that effectively communicate the intended message. Author and renowned cartographer Cynthia Brewer demystifies the basics of good cartography by walking readers through layout design, scales, north arrows, projections, color selection, font choices, symbol placement, and various export options—all of which lead to the creation of publication-worthy maps. The book also includes an appendix that describes the author’s popular online color selection tool, the ColorBrewer application. December 2015, 260 pp. Paperback ISBN: 9781589484405 and e-book ISBN: 9781589484375.